From the filthy streets of Providence to the grandest mansion in New York City—the urchin Betsy Bowen became Madame Eliza Jumel Burr, Vice Queen of America. Her legacy lives on—in the Morris Jumel Mansion of Washington Heights, where her spirit still lingers, 147 years later. During her ninety-one years, she begged on the streets, sold her body, married a rich man, married a former Vice President, and as New York City’s grand dame, traveled Manhattan in the coach Napoleon Bonaparte gave her. Throughout her adventurous and unconventional life, Eliza’s one regret was that she could not publicly announce that George Washington was her father. When Eliza was ten years old, her mother told her of Washington’s visit to Providence. They spent one night together at the home of Freelove Ballou, an aunt who later adopted Eliza. She was born nine months later. Her many attempts to reach her father gained her an invitation to Mount Vernon weeks before his death. Eliza’s love of make-believe brought her to Manhattan’s John Street Theatre, where she played many leading roles. When the theatre was bought by a speculator and torn down, she “made a living how I could” – at the brothel of Manhattan madam Sally Marshall, whose ladies entertained senators and other prominent figures. Eliza met the charismatic Aaron Burr when he became New York’s Attorney General. While standing outside Federal Hall after President Washington’s inauguration with her best friend Susannah Shippen, she caught a flash of dark eyes that sparkled and caught the sunlight like jewels. Susannah innocently introduced them, unaware of their instant attraction. Eliza named her only son George Washington Bowen, believing Aaron was the father. While Aaron climbed the political ladder on his way to the Vice Presidency, Eliza met wealthy wine merchant Stephen Jumel, a native Frenchman. Knowing Eliza’s heart belonged only to Aaron, he wooed her and trusted her to invest his capital in Manhattan real estate. With her shrewd negotiating skills and street smarts, they amassed an empire. On Eliza and Stephen’s first trip to France together, the fallen and beaten Napoleon Bonaparte boarded Stephen’s brig the Eliza, seeking an American vessel to ensure his escape from the British. Stephen, in all seriousness, offered the Emperor a wine barrel to stow away in. The Emperor, haughtily put out when he realized Stephen wasn’t joking, accepted Eliza’s invitation to hide in their New York home, but never made it to the new world. However, he did give Eliza his yellow coach and other costly gifts, now on display in the Jumel Mansion. Stephen’s business connections afforded him and Eliza introduction to the upper echelons of Paris society. She met King Louis XVIII, but he shunned her begging to let Stephen join court circles. Back home, she resumed her love affair with Aaron, whose wife Theodosia had died of cancer. He was now Vice President, having lost the presidency to Thomas Jefferson. Eliza asked him to marry her, but he turned down her proposal. He just wasn’t ready for remarriage. After the most famous duel in American history, Aaron fled New York City while Alexander Hamilton lay dying. When Hamilton died the next day, Aaron was indicted for murder. After four frantic months, Eliza finally received a letter from him, under an assumed name, R. King. Financed by his son-in-law Joseph, he’d bought the rights to a half million acres in the South. He planned to make it into a new state, settle it with adventurous pioneer men, attract a slew of colonists and settlers, and make himself Governor. His next hurried missive told her that he’d abandoned the entire plan. Why? He didn’t say. But President Jefferson had filed a formal charge of treason against Aaron. He was brought to Richmond, Virginia for trial. He’d gathered so much support and adoration from Richmond, he was wined, dined and acquitted, with his daughter at his side. He finally returned to Eliza after finishing out his term as Vice President, but soon sailed for England. Believing her life with him was over, she dragged herself back to Stephen and proposed marriage to him—only to be turned down once again. Determined to become Mrs. Jumel, she faked her impending death with the help of a loyal servant, a bottle of hot water to raise her temperature, and white powder to mimic deathly pallor. She called her doctor and had a stable hand inform Stephen that she was dying. When he rushed to her bedside, she begged him, “Before I leave this world, it would mean so much to me if I could leave as Mrs. Jumel.” He summoned a priest and they were wed even before she received last rites. But of course she made a miraculous ‘recovery’ and once again, returned to her wheeling and dealing. While tending to his farmlands, Stephen fell from a cart and died in Eliza’s arms two days later. She was brought up on murder charges which were dropped. A despondent Eliza once again turned to her true love, Aaron, back in New York at his law practice. She finally became Mrs. Burr at age 56. Aaron was a robust and youthful 78. He began to spend Eliza’s money recklessly, plowing through $13,000 within a few months. The bickering became grounds for divorce when a maid caught him in a compromising position with another woman. Brokenhearted, Eliza hired a lawyer who handled family matters—including divorces. His name was Alexander Hamilton Jr.
Aaron received the final papers on September 14, 1836, and died later that day. 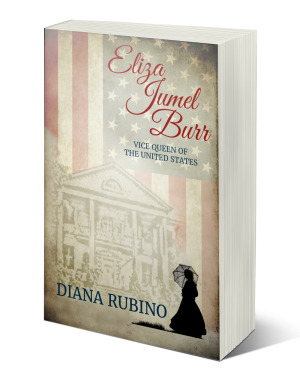 Eliza returned home to her family and lived another 29 years as Mrs. Burr, the name she’d always longed for. The Morris-Jumel Mansion still stands in Harlem, New York City and is open to the public.